NETWORK FINALS: ABC’s NBA game adjusted up to 1.0, and the 2 hours of DATELINE lost 0.1/0.2 in final numbers. CABLE HIGHLIGHTS: As COLLEGE BASKETBALL heads to the NCAAs, ESPN’s games were at 1.23 (Duke vs. North Carolina)/0.81 (Michigan vs. Michigan State)/0.42/0.38/0.29/0.22. 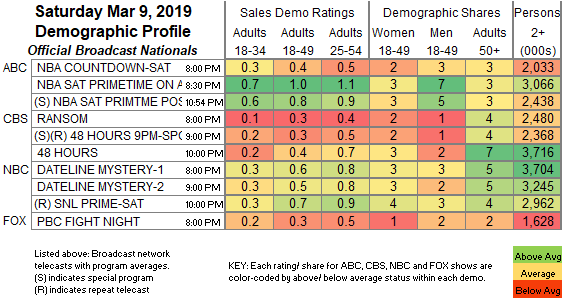 A&E’s LIVE PD ticked up to 0.64, with the clip-show lead-in hour at 0.32. Adult Swim’s line-up performed as follows: DRAGON BALL at 0.38 and 0.15/447 & 0.15/423K compared to last week’s 0.42 and 0.16/470K & 0.15/426K, BORUTO down 0.05 to 0.26, MY HERO ACADEMIA down 0.03 to 0.26/563K, SWORD ART ONLINE down 0.07 to 0.21, MEGALOBOX down 0.02 to 0.20/445K, JOJO’S BIZARRE ADVENTURE down 0.02 to 0.19, BLACK CLOVER down 0.03 to 0.17/383K, HUNTER X HUNTER down 0.02 to 0.14/333K, NARUTO down 0.02 to 0.14/343K, and ATTACK ON TITAN down 0.02 to 0.12/293K. On Food Network, PIONEER WOMAN jumped 0.11 to 0.29, and KITCHEN AT FN was up 0.02 to 0.27. Disney’s morning MUPPET BABIES was at 0.23. On OWN, IYANLA, FIX MY LIFE rose 0.09 to 0.23. Travel Channel’s GHOST ADVENTURES lost 0.03 to 0.22. 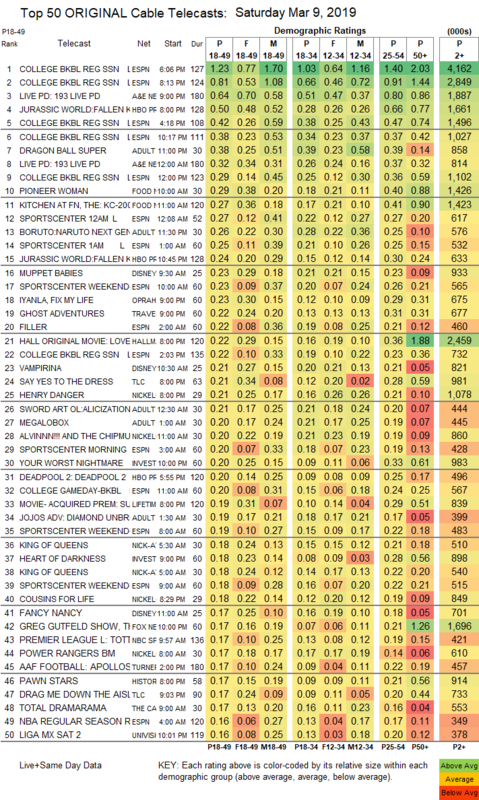 Hallmark’s original movie LOVE UNDER THE RAINBOW was at 0.22, and Lifetime’s movie SUBURBAN SWINGERS CLUB was at 0.19. TLC’s SAY YES TO THE DRESS gained 0.04 to 0.21, and DRAG ME DOWN THE AISLE was at 0.17. ID’s YOUR WORST NIGHTMARE dipped 0.04 to 0.20, and HEART OF DARKNESS was down 0.03 to 0.18.